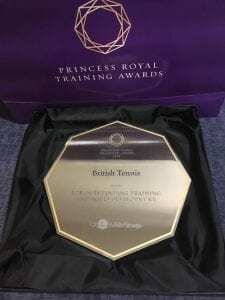 We were absolutely thrilled in early October when we were informed that the ‘Business of Tennis’ training programme we created for the Tennis Foundation had been awarded the Princess Royal Training Award. 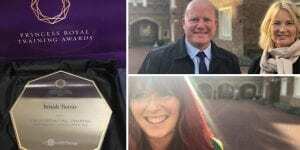 Our Head of Experience Kirsty Mac attended the ceremony on October 31 along with National Community Indoor Tennis Centre Manager Scott Reid, to receive the award. Speaking after the ceremony she said: “It was a really proud moment sitting in St James’s Palace. I think it hit me when I was sat there and thought we are actually in the palace. The Business of Tennis programme was created by Raise the Bar in collaboration with the Tennis Foundation and the LTA, who are both working in partnership to support the Community Indoor Tennis Centre (CIT Centre) network. Our training programme has helped and will continue to help the 53 UK CIT Centres that are so vital to communities around the country. On the process of producing a training programme with a Royal seal of approval, Kirsty added: “From the first time we started doing the needs-analysis with Scott – originally it was a leadership programme – but we very quickly saw it was a business development programme. I remember there was one point when we were doing what felt like an epic tour of tennis centres, gathering needs and understanding the requirements, where we’d been in the car for a long time and he turned to me and said, “is this possible?” and firmly at that point I just said “absolutely”. To see Scott from the LTA get up on stage to receive the award was a genuinely humble moment. I really wanted to recreate that Julia Roberts moment from Pretty Woman where she shouts “woo-woo-woo” but it’s apparently uncalled for in the palace. It was really, delightful to see the difference in all the organisations that there were too. It was a genuine and quite surreal moment. Click to find out more about our Learning and Development programmes, as well as the bespoke apprenticeships we offer.